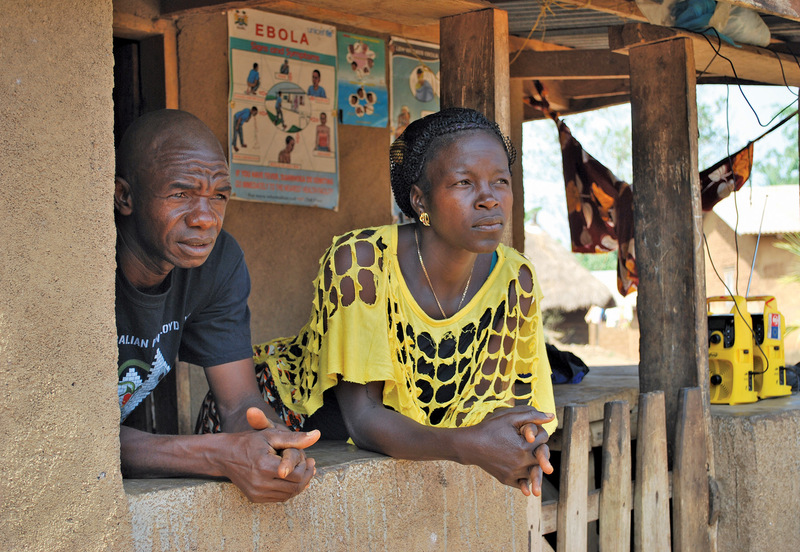 Tamba and Mamie Lebbi on the porch of their home in Sokoma village. It’s 7am and the village of Sonoma is coming to life. The regular thump of wood pounding cassava echoes around; children are dancing to solar-powered radios lined up on a porch. Others are crouched around a saucepan shovelling in handfuls of rice for breakfast. Ebola stole into Sokoma in the remote eastern-most district of Kailahun along one of the footpaths that snake out of the village into neighbouring Guinea. The only clue that the disease ever visited this place now is a shuttered-up, silent dwelling. And the graphic Ebola ‘signs and symptoms’ warning posters, which are plastered all over Mamie Lebbi’s house. The first person to test positive for the virus in Sierra Leone, Mamie Lebbi was also among the first to survive it. She sits for the interview with a look of irritation that she will wear throughout. A lean, powerful woman in her early forties, she gives the impression of one who does not tolerate fools gladly. Her smaller, more genial husband, looks on. Despite her landmark status, she missed out on a ‘survivor’s certificate’ that would bring with it free access to high-quality healthcare and funds. And she is royally sick of being questioned. She is now looking after three Ebola orphans, as well as five children of her own. When Ebola came it was unknown to us. That’s why so many people died. My best friend Siawanda brought the disease through a small village called Kpundo close to here. She is free and open with everybody, so she had helped to wash the body of a friend that died in Guinea. Then she got sick. Anyone who touched Siawanda died: her aunty, three of her children and all the doctors that treated her. Her eldest daughter brought the virus back to Sierra Leone. Soon, people were dying everywhere; no-one knew why. People thought it must be cholera – we had never had that here – and no-one was vomiting blood like on the government Ebola posters. My husband’s sister caught the disease, then his mother. I took care of her here in the village, and got infected. I went to the clinic in Koindu [eleven kilometres away], where they treated me with drips, as if it were cholera. They took a blood sample from me. After a week it came back positive for Ebola. I was very afraid; now I was sick I expected to die within 21 days. A team came to take me to Kenema hospital [site of Sierra Leone’s only isolation unit, set up for Lassa fever infections]. I trusted the clinic in Koindu but I did not want to go to that hospital. I knew that Mercy, a nurse from the clinic, had died there and I was fearful that I would not survive the journey. And that, if I died there, my people would never see my grave. I believed that I had Ebola – it had wiped out three households of my family by then – but in those days, we were told there was no cure. There were no specialists for Ebola, no proper care and people were dying all over the place. Now we have foreigners to assist, but then there were no treatment centres. People were just left in the wards and whether you survived was just in God’s hands. The community refused to let them take me to Kenema. They said: ‘It’s not Ebola, you can’t take her.’ I have a very strong system and after the treatment at the clinic [in Koindu] I could stand, so I decided to run away. I walked out of the clinic at 2am. Other people tried to escape, following my example. Their families carried them out on their backs. I hid until dawn and then caught a motorbike to try to cross the Guinean border but they turned me back. I thought the authorities would be coming in search of me, so I hid in the bush near here. I spent two weeks there. At night, I would creep out to sleep in an old storeroom. My husband had made up his mind to stay with me. He said: ‘She caught Ebola from my family and I will not leave her. If God wills that the two of us should die, then let it happen, but for better or for worse, I am with her.’ He acted like a father to me. He understood that I had Ebola, so he straightaway knew what to do: to stop body contact. While I was sick at the clinic, everyone in his family had died. I worried about my children at home, and the family I had lost. But I put my faith in God. After I survived in the bush, I felt God had protected us. I hugged my husband, greeted him as I used to do. Our relationship is stronger now.